Counting down now…and not just to Christmas, but to some great trout fishing that's starting to fire up. The freshwater season has been a bit variable in some regions with the wet spring we've had, but as summer beds in, conditions are improving. 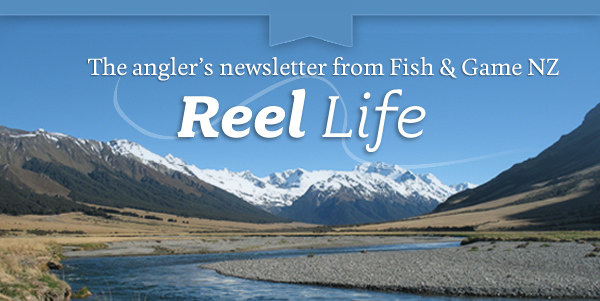 The Waimakariri River has offered some good trout fishing in the lower reaches. One weighed 4.5kg (10 pounds), and some others were getting close to this. Some big fish are being caught in the McKenzie basin canals; a holidaying staff member just caught an 8kg (18 pound!) lunker. With all the insects that are now hatching and the first cicadas abuzz, fish are rising…and there are now more dry fly opportunities in both islands. Fish & Game has received an unexpected and welcome Christmas present in the run up to the big day. Warren Kelly, one of the founders of Walrus New Zealand, manufacturers of waders, among other things, has gifted some sets of brand new waders as he prepares to retire north of Auckland. Many thanks and Merry Christmas Warren – they will be well used. Make the most of your summer holiday break and may your lines be tight! P.S. 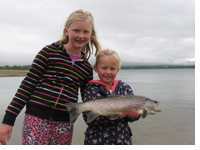 - This month's cover pic shows Siobhan (9) and sister Jordyn (6) at Lake Opuha with a lovely brown. A salmon company and Fish & Game have joined forces and gone to the rescue of the South Westland Salmon Farm. Thousands of salmon were killed during a burglary at the Lake Paringa farm when machinery was tampered with. Salmon Smolt NZ provided 8000 fish and North Canterbury Fish & Game's Montrose hatchery gifted another 6000 to replace the fish that died. For details click here. Sixty-five tonnes of accumulated silt has been blasted out of a Christchurch stream in an effort to entice trout back to breed, and improve the habitat for other aquatic life.Recently North Canterbury Fish & Game staff spent two weeks co-ordinating the removal of sediment from the Wairarapa Stream in western Christchurch. More information here. As many of us prepare to head off to favourite holidays spots and fishing places, an environment group is ramping up a lobbying campaign for more stringent "bottom line" rules around freshwater quality. The move follows yet another report showing that water quality in rivers that run through intensively-used land has worsened. Click here for details. The editor of Fishing News Grant Dixon shares some basic strategies that have served him well over the years and put plenty of fish through the smoker. Click here. Shingle slides can be fun. There is a huge rush of adrenalin as gravity takes you down in a skidding rush, the noise of sliding gravel building as you go, and you hit the valley bottom on the run, with an eye over your shoulder for any boulders you may have dislodged in the landslide. It's the fast way down from the tops, and it's dangerous, as he discovered when he slid over a 2-metre vertical drop, invisible from the top, and his pack was impaled on a spike of ancient beech poking out of the gravel.